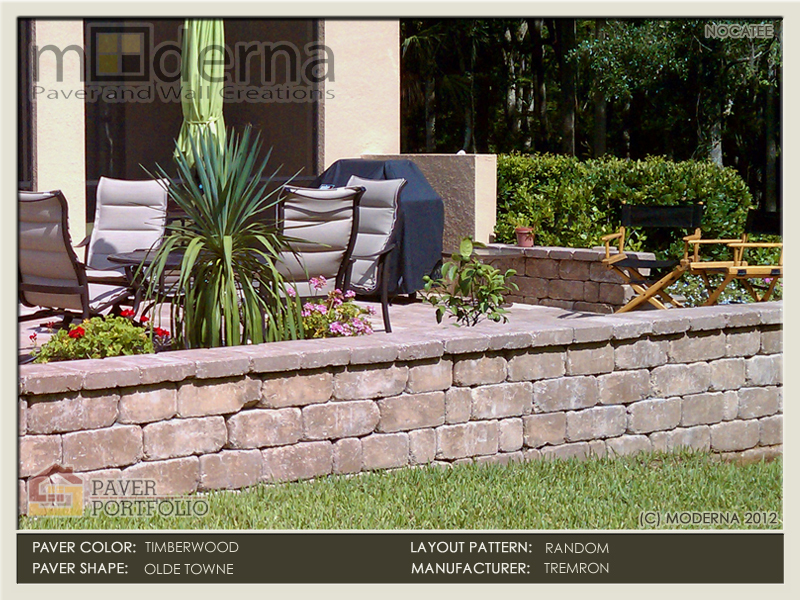 ​This Jacksonville paver portfolio section includes just the photos of various projects including Paver Driveways, Paver Patios, Paver Walkways, Sitting Walls, Retaining Walls, Hardscape construction Photos and More. Brick Paver Driveway construction in Ponte Vedra Beach. 8x12 Plaza Pavers in Running Bond layout pattern. Sierra Color. 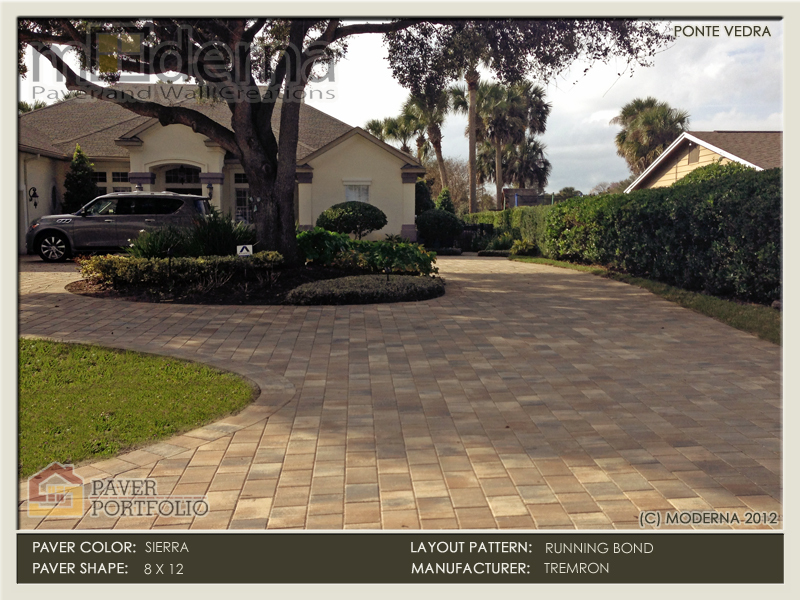 Ponte Vedra Paver Driveway in Marsh Landing. Tremron's Mega Olde Towne in a Random Pattern. Olde Chicago Color. Brick paver driveway installation in Jacksonville FL. 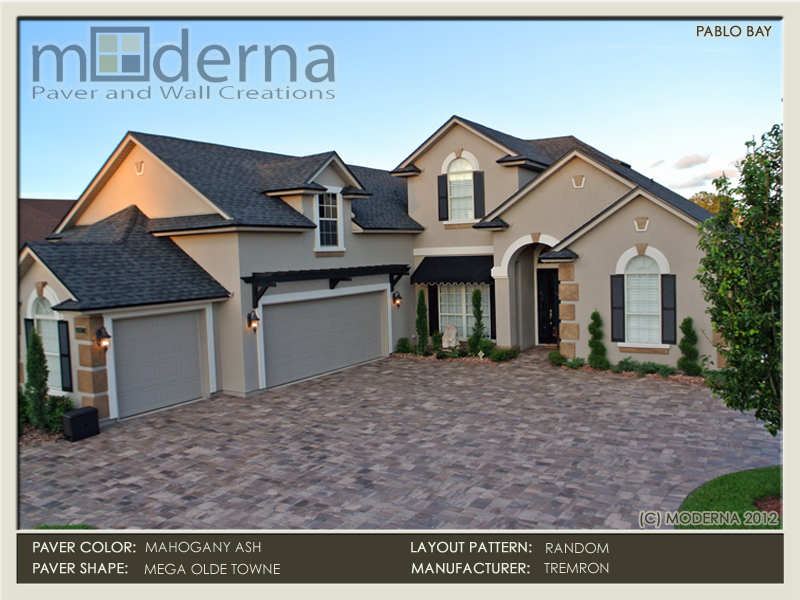 This paver driveway features Mega Olde Towne pavers in a Mohagany Ash Color. Jacksonville paver driveway renovation. These brick pavers are 2 piece Olde Towne. The color is blended with Quicksilver and a Granite color border. Paver Staircase and Retaining Wall along the Ponte Vedra Oceanfront. Anchor Carbondale Wall. Knights Brigde Pavers. Paver Driveway installation in Jacksonville FL. Circular paver pattern blending into a random Olde Towne Pattern. Oak Run Color. New construction pool paver project in Jacksonville. 12x12 square plaza pavers in a circular inlay with a diagonal pattern. Cappuccino color. Hardscape planter boxes with seating wall and other hardscape elements. Pavers are 3 Piece New England style from Flagstone Pavers. Brick Paver patio and Retaining Wall installation in Nocatee FL. The retaining wall makes up the slope in the yard. Timberwood color. Outdoor Living room hardscape construction in Jacksonville FL. Mega Olde Towne pavers in a random pattern. Sierra color pavers. Brick paver walkway installation in Jacksonville Beach. 3 Piece Olde Towne layed out in a random pattern. Olde Chicago color. Brick Paver driveway installation in Jacksonville FL. Olde Towne pavers in a random layout pattern. Harvest Blend color with a Charcoal border. Jacksonville paver driveway construction. Mega Olde Towne pavers in a random pattern. Mahogany Ash color with blends of Brown Tan and Coral. 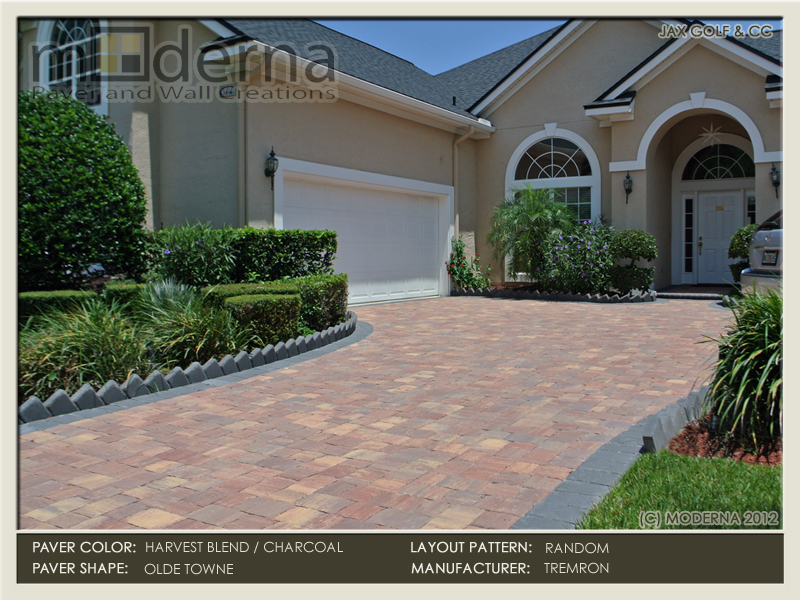 Circular brick paver driveway installation in Jacksonville FL. This driveway is 2 Piece Appian Combo pavers in the White, Tan, Charcoal blend. 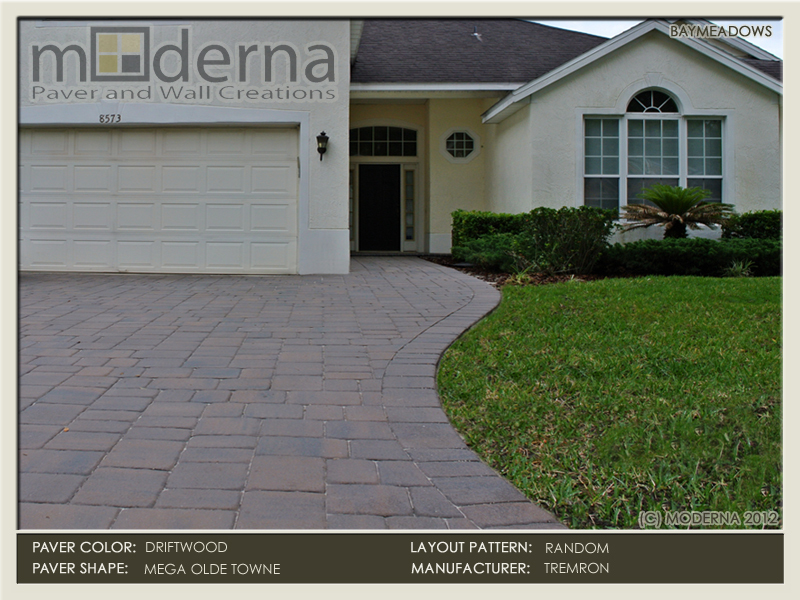 Paver driveway installation in Jacksonville Fl by Moderna. Mega Olde Towne pavers in a random pattern. Mahogany Ash color. Brick Paver Driveway and Entry in the King and the Bear in St Augustine FL. Mega Olde Towne pavers in a random layout pattern. Sierra color. World Golf village King and the Bear paver Driveway installation. Tumbled Stonehurst paver style. Santa Fe color with blends of Tan and Charcoal. Paver pooldeck in Jacksonville FL. Stonehurst paver style in a Random layout pattern. Large style Sierra bullnose coping. Sierra color pavers. 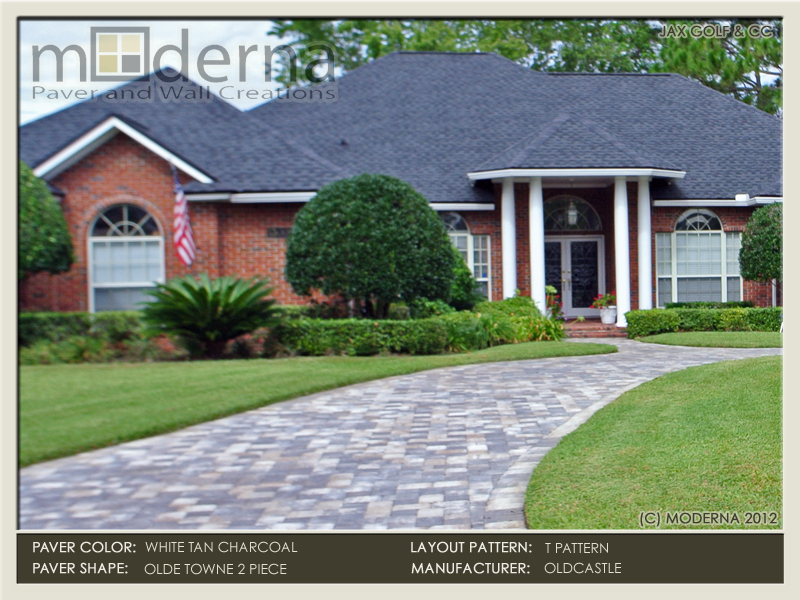 Brick Paver driveway construction in Jacksonville FL. the drive features Olde Towne pavers in a Random layout pattern. Harvest Blend color. Baymeadows paver driveway construction. This drive and walk uses Tremron's Olde Towne pavers in a random layout pattern. Mahogany Ash color pavers. Brick paver driveway and entryway installation in the Plantation community in Ponte Vedra Beach FL. Pavers are Olde Towne shape and Sierra color. Large paver driveway construction in Ponte Vedra Beach FL. 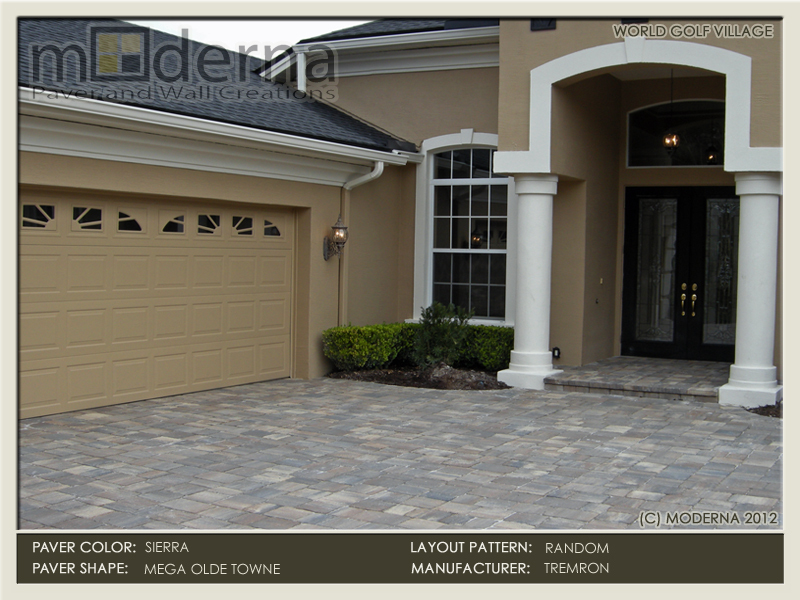 Mega Olde Towne shape in a custom color blend of Sandstone and Buff. Queens Harbor paver driveway and walkway. Olde Towne pavers in a random layout pattern. Harvest Blend color with a Charcoal border. Paver driveway renovation in Jacksonville FL. 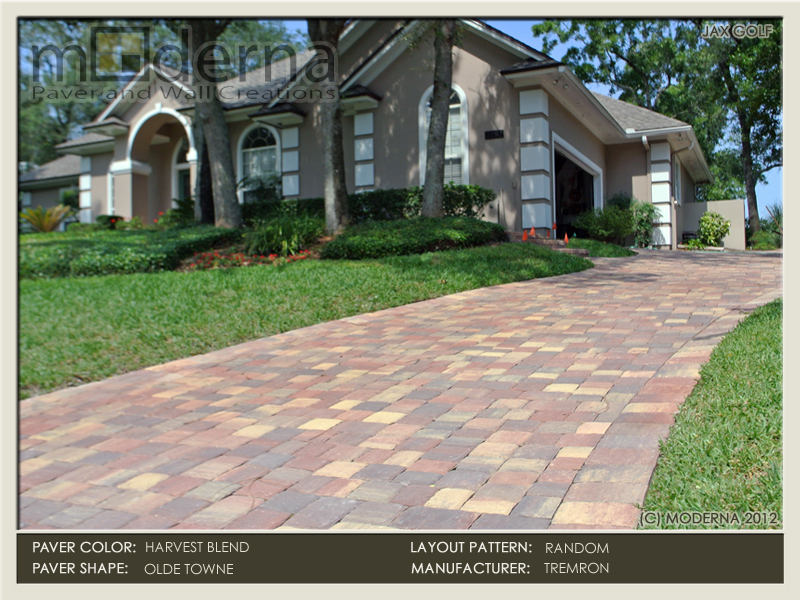 This driveway features a 2 Piece Olde Towne paver in a T Pattern. Quicksilver color field and Granite Border. Brick paver driveway construction in Jacksonville Beach FL. Stonehurst style pavers laid out in a Random pattern. Sierra color pavers. Large paver driveway in the Plantation Golf and Country club in Ponte Vedra FL. Mega Olde Towne pavers, Cappuccino color. Large paver driveway and retaining wall in the Plantation Golf and Country Club. This home has won awards and is featured in the Ponte Vedra Parade of Homes. Paver driveway on a brick home in Deercreek Golf and Country Club in Jacksonville FL. Mega Olde Towne pavers in the Oak Run color. 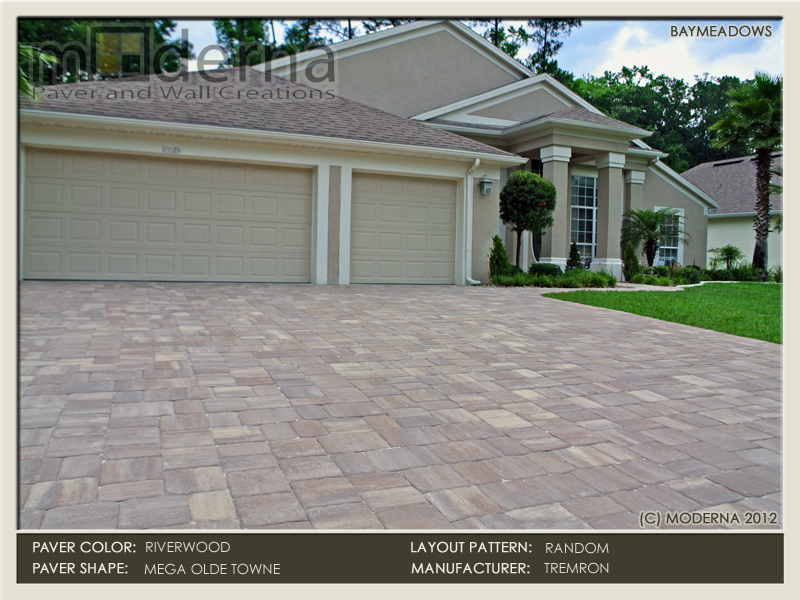 Baymeadows paver driveway installation in Jacksonville FL. Mega Olde Towne pavers in a Random layout pattern. Driftwood color. 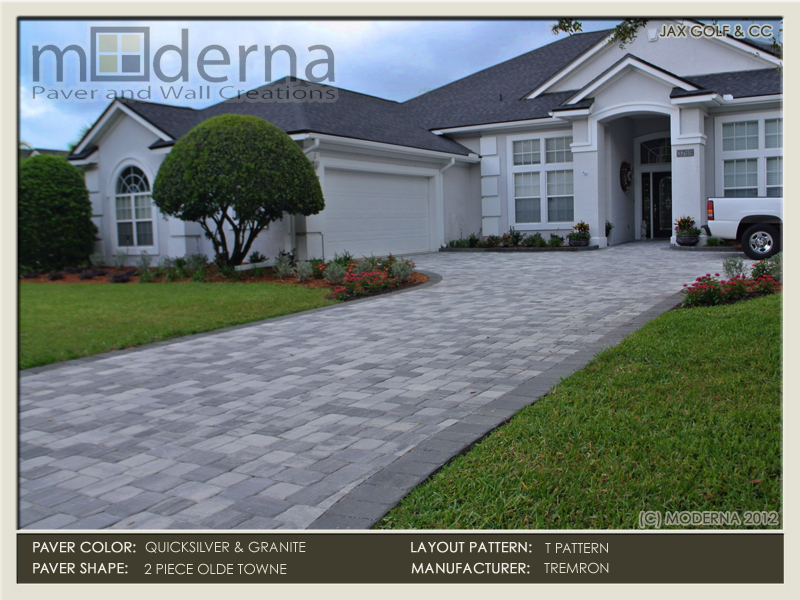 Paver driveway and walkway installation in Jacksonville FL. Mega Olde Towne pavers in a random pattern. Riverwood color. Brick home in Deercreek golf and country club new paver driveway installation. 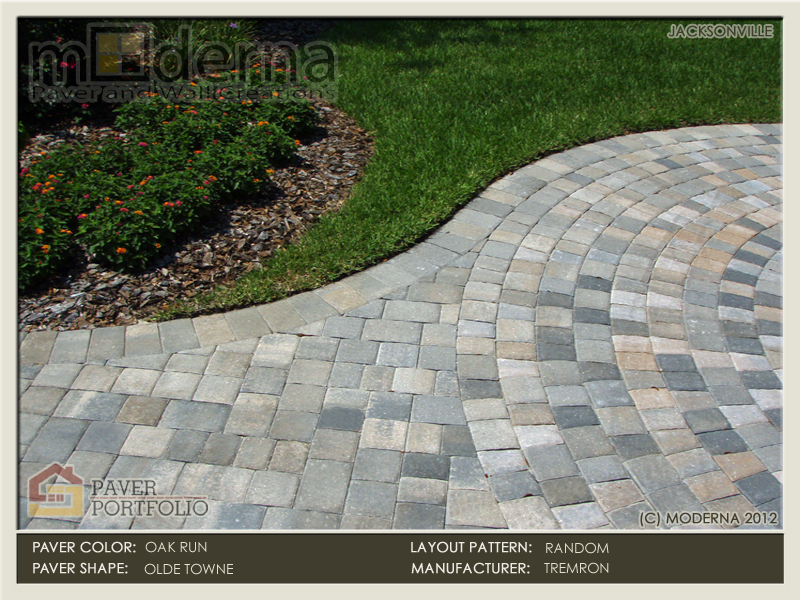 Mega Olde Towne pavers, Random Layout patttern, Rustic color. Paver pooldeck, pergola, bar, hot tub, and outdoor kitchen area. 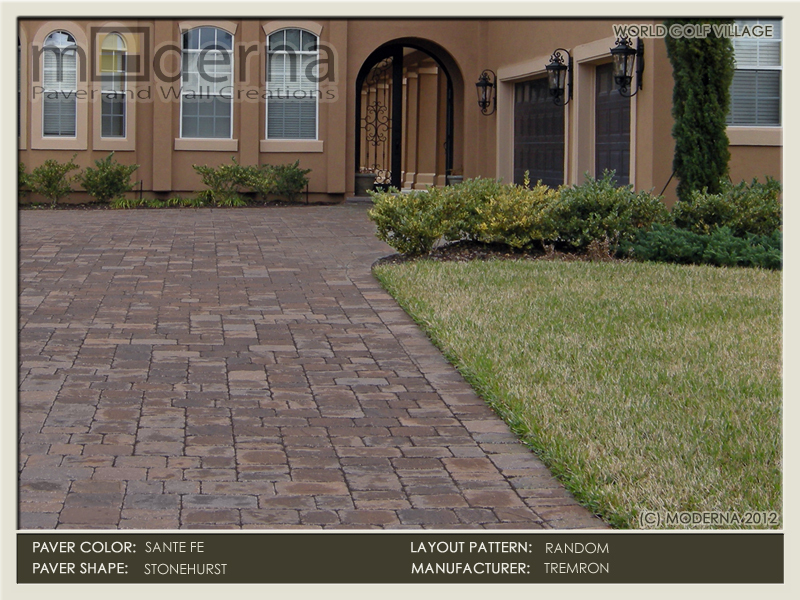 Stonehurst pavers in Sierra color. Jacksonville FL.